Ilan had been so impressed by the sight of the dome and the energy that emanated from Aaima that she totally forgot about making any questions. When Ilan and Tenzin crossed the gigantic door of the dome and stepped outside they saw Wajada sitting on a log on the left, and approached her. Ilan’s eyes were wide open and she couldn’t pronounce a word yet. Ilan looked inside and saw a faint glow. Ilan thought of the day when her mum brought to her her first watercolor kit, and she smiled. And whilst she was smiling, the glow became brighter. The lamp glowed even more, and now with that expanding light they could see more of the village around them. “I’m all ears” said Ilan. I really like the concept of the lamp being a reflection of her moods. Very creative way to view moods and to create a catalysis for changing them. 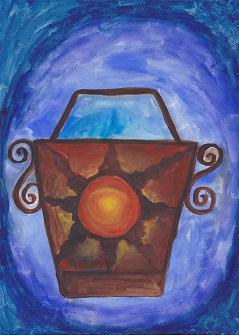 I was reminded of the Hermit…and I think that lamp that he carries will have more meaning.